The third instalment of ‘Zounds! is coming. The Mad King is destined to be amazing with some great submissions already in. If you would like to be a part of the epic journey along with the Bard Brawlers, click here and check out the submission guidelines. Better yet, buy a previous edition and get the idea of what ‘Zounds! is all about. Here is an poem from ‘Zounds! Act I, scene ii: T by poet, singer/songwriter, playwrite and overall good guy Andre Simoneau. Enjoy. Listen to or download a dramatic reading by Andre. what is a corpse in a hole? before they become more lack than presence? what is it to touch? what is the weight of evil? what is a mouth full of shade? 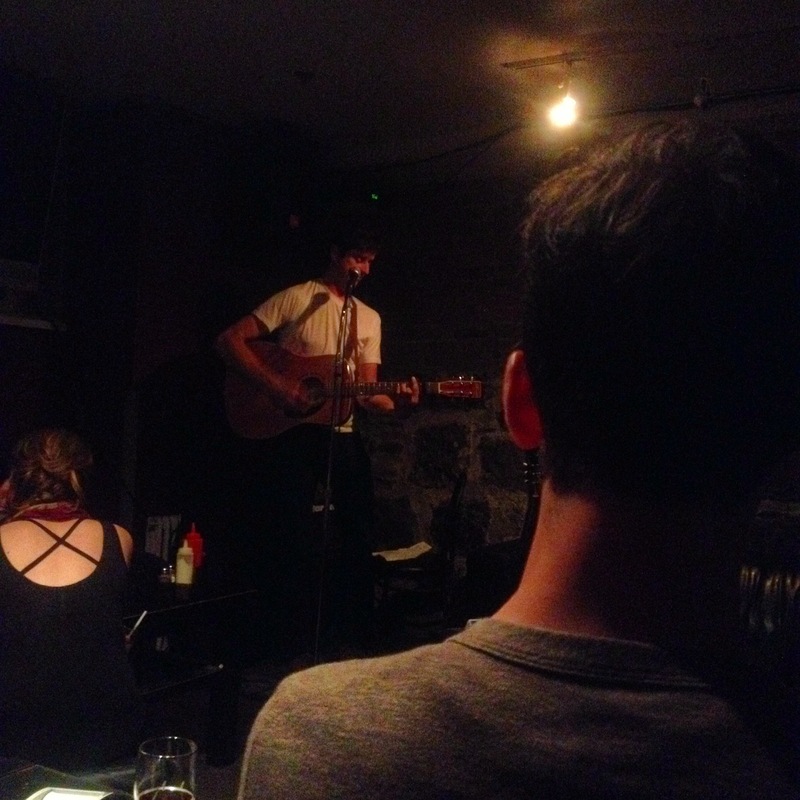 Poet, singer/songwriter, playwrite and overall good guy Andre Simoneau at the mic. Here is an entry from ‘Zounds! Act I, scene ii: T by fashion writer, designer and artist Stephanie E.M. Coleman. Enjoy. Let’s admit we all follow trends. Hypercolour t-shirts? Yeah man. My armpits were blue and the rest of my shirt was pink, but it was cool. Lipstick pink Juicy Couture velour tracksuits? Hot, in a Paris Hilton kind of way (glittery trucker hat mandatory, of course). Rave pants and soother necklaces? Sweet dude, just don’t forget your angel wings. These are all lovely memories and everything, but we all hope they remain the stuff of ironic Halloween costumes and nothing more. Perhaps you shuddered a little like I did when leggings came back in style, around 2005. Gazing at the racks of flimsy legwear at the retail store where I was working at the time, all these memories of lace trimmed white leggings I wore in grade 2 came flooding back to me. And I was expected to build a wall display with these things? I mean right in front of me I had evidence that the trends I wore as a kid had now cycled back into the forefront of designers’ minds, which would mean that they were vintage. That was a blow my 23 year old mind had a hard time absorbing, though I’ve since gotten used to the phenomena. (Hedi Slimane’s 2013 ‘grunge’ collection for St. Laurent was the real kicker.) I’m now sort of numbed to any further appropriations. Fashion trauma aside, it would seem that leggings are here to stay, clinging to the flesh and gripping onto every contour and sinew in all their spandex glory. Printed with skulls or crosses à la Alexander McQueen, classic black, or granny style floral, tights are the ubiquitous fashion non-statement that just won’t quit. Stubbornly resistant to the ebb and flow of fashion, we see them turn up time and again under skirts, shorts and tunics. Black Milk Clothing leggings (see right) are a favourite of the Bard Brawl and may just appear in the third instalment of ‘Zounds! Yep. That’s the first act of Hamlet on her legs. Yes, in case you hadn’t heard, ‘meggings’ first appeared on Givenchy’s runway in 2013 with black tights worn under shorts. The look has since become a streetwear trend in Europe and New York, with designers like Rick Owens following suit, er…Spandex. They are even somewhat acceptable worn as ‘pants’ for gals, despite the fact we can see right through them to the polka dots on the wearer’s underpants. Though I understand the popularity of such a comfortable no brainer garment, I can’t say I agree with such practices – especially the above mentioned “pants impostor” faux pas that assaults the eyes far too often. Hmmmm…I actually do think meggings are pretty cool though. Before we gasp at the daring of Givenchy’s meggings, we should really take a minute to remember that there is nothing new under the sun. Indeed, a few centuries ago was penned a play featuring a hilarious quandary about a certain pair of yellow tights, cross gartered. When I first read Act II of Twelfth Night, where Maria writes to Malvolio in the guise of Olivia, urging him to don his ‘yellow stockings, cross-gartered’ and woo her, I couldn’t quite picture the look. It sounded delightful, though. A little research at bardbrawl.com, and I quickly discovered that cross gartered yellow tights were de rigeur in court at the time Twelfth Night was written. Yellow was the ‘It’ colour of the season, and the decorative cross garters were an innovation to hold up the stockings before the advent of our dear friends, Lycra and Spandex. Who knew? Poor Malvolio. It’s kind of tragic. He was so excited! I mean, he was taking a real fashion risk and expressing himself and then it blows up in his face. I can just imagine him strutting his stuff, thinking this outfit was really gonna seal the deal with Olivia, while she looks at him like he’s gone mental and all the while Maria and co. are snickering at him from behind the bushes. You know, I really think Malvolio was hanging out with the wrong crowd. They just weren’t ready for his avant-garde fashion sense. Too insecure. Hello! I thought this play was supposed to be set in Italy. How far is Illyria from Milan, anyway? I guess it’s a little too far from the fashion capital for anything to trickle down. Like showing up at the Calgary Stampede in meggings, it’s just not going to be well received with this crew. I do think there is a greater lesson to be learned from Malvolio’s mishap. When you step out and make a bold fashion statement, you become an easy target. Crowds are uncomfortable with the audacious confidence required to try out, say, peplums. So should Malvolio be ashamed, hang his head and exit the stage to Charlie Brown music like that Arrested Development episode? Maybe not. I say wear what you love, what makes your imagination run wild, what inspires you, what tells a story. Hold your head high, and remember you have Bill Cunningham on your side! In the end, I think Malvolio had the last laugh. What started as sabotage turned into a sartorial mainstay. For real, let me know when everyone has stopped wearing leggings for good. I doubt that day will come anytime soon. The Bard Brawl is currently accepting submissions to the third edition of ‘Zounds! a Bard Brawl Journal. William Shakespeare’s work is littered by the acts of mad kings. The most obvious example to use as inspiration is Lear, but scratch the surface of Richard III, Richard II, Henry IV, John, Leontes and many more and one can always find a little of the crazy. Be as literal or as abstract as you like, but always be brawly. As a bonus, ‘Zounds! is running its first ever writing and art contest in this edition. It is highly recommended that you pick up a past copy of ‘Zounds! to get an idea of the type of material we print. You can order a copy here. Use high resolution JPEGs for artwork. For those eagerly awaiting the arrival of Act III of Richard II, fear not; it will soon ring out on podcast speakers around the globe. Click the button and let ‘Zounds! be yours. Special thanks to the staff at Brutopia for hosting the launch, and to Andre Simoneau and Brendt Thomas Diabo for playing. Brendt Thomas Diabo playing the ‘Zounds Launch. Matching and dashing are Brawlers Jay Reid and Amrit Sanger. It’s been a few months since the last time the Bard Brawl threw a brew pub bash but the wait is finally over! We’ve got something to celebrate: the latest issue of ‘Zounds!, which we’ve called Act I, Scene ii: T, is finally ready to be unleashed upon the world! We want you to come get your Bard on with us at Brutopia, on Thursday, July 10th, starting at 8pm! You know the place. Looks kind of like this but rowdier! The only thing missing in this picture is you, beer and ‘Zounds! Once again, we’ll be offering copies of the latest issue of ‘Zounds! for a special Brawler price of $10 each for anyone in attendance. We’ve also upped our game this time and in addition to some great ‘Zounds! readings, Brendt Thomas Diabo will provide some awesome live drinking music! If you’re planning to come by – or would like to but can’t because you’re busy working on your pick-up monologues – why not swing by our Facebook Event page and let us know? And while you’re there, why not spread the word? We’d really appreciate it!